We are all aware that YouTube has come up to be the most favorable for content creators in recent years. The easy eligibility requirements for YouTube monetization laid out in January this year has also attracted a chunk of content makers to showcase their contents and start rolling the YouTube business for themselves. YouTube over the years has been the most preferred and the go-to website for video sharing but the fact that the platform does not have a monopoly is clearly understood after the release of IGTV, its counterpart in June 2018. IGTV was also quick to announce they have reached 1 billion users. The question that stands now is whether IGTV shall replace YouTube to be the most used video sharing platform? IGTV is a Vertical Video Application which is owned by Instagram. Instagram, the platform which has the most number of registered users (800 million) after Facebook very recently gifted its younger crowds with a standalone application that uploads videos up to a standard length of 10 to 60 minutes. The growth potential of IGTV is regarded as high enough to match YouTube’s solely for the fact that it is under the banner of a social media platform which is known for eating all its competitors. Instagram users shall find an alternative for YouTube in IGTV but even the creators admit that there is no better platform as to publish a video content than YouTube and it is here to stay as the biggest place for video creators for a very long time. IGTV has the potential to catch up and may hold a second position in the race. The creators are directly highlighted as to bring the younger crowds closer to IGTV access. The promotional images of IGTV are grabbing all the eyeballs as it features King Bach, the former Vine star and actor, and influencer Roy Purdy. The 500 million daily users on Instagram are expected to be the first and the immediate IGTV users and the number is likely to increase in the upcoming years. The goal of IGTV is like any other online media platform- to connect but only via video contents. Instagram stories are a mere 15 seconds videos that are used to share stories and short reels. IGTV widens the concept of Instagram stories by publishing videos that feature internet sensations. It shall cater to Instagram users with better media of entertainment and also be an alternative to the ones existing. IGTV is set up on targeting young audiences with celebs creating all the ‘cool’ contents for them exclusively on the platform. The Instagram users would have quick access to IGTV with the IGTV button on Instagram. IGTV is also a separate app that they can be downloaded. IGTV definitely comes as an encouragement for video creators. Instagram shall no more be a platform only to share the link to your YouTube channel with your followers. 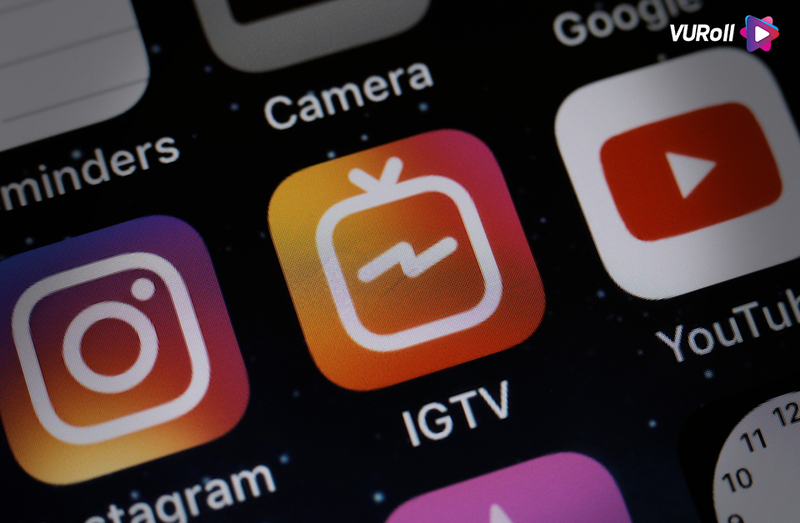 Rather the video makers may choose to explore a different media to share their full-length videos on Instagram itself- IGTV. Therefore, Instagram shall serve as a complete platform for marketing and video hosting. The platform is unique even if it represents video application platforms. The ‘TV’ at in the name justifies what IGTV actually It is more like a television as the viewer sees something or the other playing from the moment he/she opens the app. There is a scope for interaction in the form of comments while watching a show. IGTV features engaging content which is yet again addicting like Netflix and Vimeo. It is a ‘Vertical’ Video application and the viewer does not have to tilt the screen to watch a video. IGTV is a newly established model and the need of the hour is to sort out activation issues. The platform is also formulating plans and strategies to make it more appealing and engaging for the viewers. However, there is no scope for monetization in IGTV as there is on Youtube which is a great drawback for the platform. Monetization on YouTube is the biggest reason for the content makers to prioritize sharing their videos on YouTube than on IGTV. The announcement made by YouTube very recently specifying that they were launching tools to help content creators with their content is another drive for the content makers to stick to YouTube and not share their contents on IGTV. IGTV does not cater to a wide spectrum of content like YouTube. The viewer can add only one channel on IGTV. IGTV, unlike YouTube, is a mobile platform which means one cannot surf it on the desktop. The bottom line is that IGTV is not an all-purpose platform like YouTube and it might take a while for IGTV to replace it. While YouTube seamlessly caters the viewers with unlimited channels, provides recommendations for videos and its monetization policy has an incentive for content makers, IGTV is inclined to more personal contents as yet. There is a possibility that IGTV will still serve as a platform like Instagram where all behind-the-scenes stories are put up while the actual polished content goes up on YouTube. Nevertheless, IGTV is attracting millennials in chunks and why not? After-all, Instagram is a rich media in itself. It is definitely a hit being the mobile-first platform as studies show that 3.3 out of 5.9 hours per day are spent streaming something or the other on mobile. Viewers can expect more personalized and authentic creations on IGTV and therefore move away from Snapchat and Instagram stories with fancy filters.